The UN estimates that at some point between 2008 and 2009 the world’s urban and rural populations became equal in size for the first time in human history. Urbanization is set to continue as the rural population seeks the wealth and social opportunity that cities offer. In the period from 2007 to 2050, the UN estimates the urban population will grow from 3.1bn to 6.4bn. As cities around the world grow in size, we are beginning to see that strained resources, infrastructure, and services are causing natural limits to urban growth, which in turn limits the economic growth opportunity. The challenge of managing sustainable urban growth is one of the defining challenges of the 21st century. In parallel, city leaders are looking for ways to establish clear identities for their cities and to use the growing connectivity of everything to improve urban life for their citizens. Cities as diverse as Barcelona, Nice, Dallas and Songdo in South Korea, are already starting to leverage advanced technologies and data analysis to create smart, connected cities. These cities, and others around the globe, are building out new digital services such as smart lighting, traffic, waste management and data analytics to reduce costs, tap new sources of revenue, create new innovation business districts and improve the overall quality of urban life. Not only will the creation of smart cities generate huge value for the cities and their inhabitants, but there are great opportunities for the vendors and partners who help the cities to create and operate these digitally smart cities of the future. Connecting all of the sensors, devices, people and data is critical to making a city smart. With highly developed wireline and mobile networks, Service Providers are at the center of providing this network connectivity. However, Cisco believes that the SPs have a much greater role to play beyond simply providing the connectivity. There are numerous opportunities for them to move up the stack to extract a much greater portion of the more than $1.5 trillion that Cisco estimates will need to will need to be invested in ICT and “smart” urban infrastructure worldwide over the next decade. To understand the best role for a service provider in smart cities and how they can make money, we need to consider three strategic dimensions – benefits, role and finance/governance. 2. Service Provider Role – We view the potential SP smart city roles as a pyramid, or set of layers with each layer supporting the layer above and increasing the potential business return as we move up the pyramid. By carefully assessing their options and opportunities along these three dimensions service providers can define a successful strategy and operating model for profiting from smart cities. 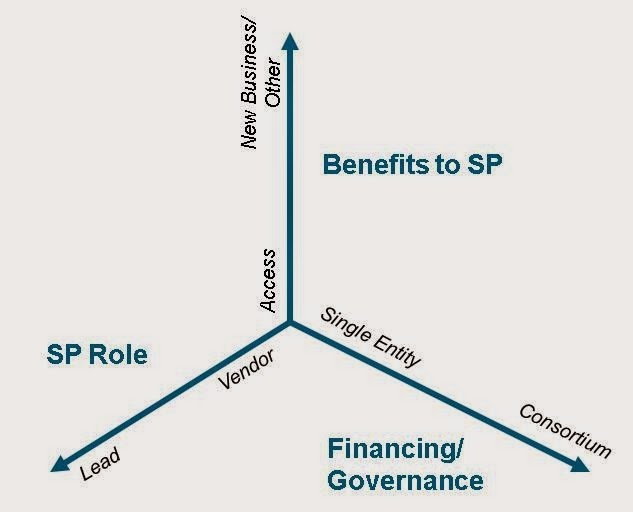 SPs are in a unique position to deliver Internet of Everything enabled, smart digital city services to key urban areas by providing a combination of connectivity, Wi-Fi network, platform, operations, implementation and integration, and specific applications and solutions.